Revelation paints a glorious picture of the worship of God in heaven. I have compiled a list of seven of the more prominent praise songs that are sung in the book of Revelation. One of my biggest questions in reading through this chapter (which frustratingly none of the commentaries addressed) was, who is the one one the throne – the Father, the Son, or the Triune God all at once? Because of the larger context of Revelation, in which the Lamb is clearly disassociated from the One who sits on the throne (e.g., 5:6, 13, 7:10, etc. ), and because of the larger context of the New Testament, in which Christ is often portrayed as “sitting at the right hand of God the Father” (which assumes the Father is sitting on a throne), I have tentatively concluded that the One sitting on the throne is God the Father. This also makes sense of the praise song’s focus on God’s work of creation. The reference in verse 17 to God’s reign beginning with this act of judgment, especially when read in light of the immediately preceding verse 15 (“the kingdom of this world has become the kingdom of our Lord and of his Christ, and he shall reign forever and ever”), is helpful for understanding the relation between preterism and millennial views. In the partial preterist view (and in some non-preterist views as well! ), the 70 A.D. judgment marked the inauguration of the millennium of chapter 20 – this is why preterists are basically either post-mill or a-mill. The preterist views Christ’s judgment on Jerusalem as a major Christological event – the public vindication of his session at God’s right hand. 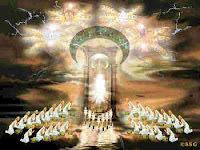 Hence John can write that Christ’s kingdom begins with the judgment associated with the seventh trumpet (which, in this view, is the judgment on Jerusalem). Its interesting to note how many of these songs, such as this one, have as their major impetus an act of divine wrath/judgment. This may lend credence to Gentry’s thesis that a major theme of Revelation is God’s judgment on apostate Israel. Nowhere else in the Bible do we get such a picture of heavenly worship (i.e., worship by angels and glorified saints) – most biblical praise songs are sung on earth. Getting a vision of this heavenly worship is such a powerful stimulus for our worship here, and our perseverance. To think – right now God is being incessantly worshiped by creatures which are so bright and awesome that we would be tempted to worship them if we saw them, as John was (19:9-10). Its more noisy, exciting, and beautiful than any concert has ever been on earth. Even just knowing that that is going on somewhere is enough to fill life with meaning. There is a place where goodness and light and happiness are untouched, unspoiled, unruined. No matter how neglected the glory of God may be among fallen humans, its not forgotten by the seraphim. No matter how terrible things may be going here on earth, the worship of heaven continues, undisturbed and un-interrupted. Well, this is my last post on Revelation. I have loved studying this book, but am ready to move on. I have been doing scattered reading from Psalms for the past few days, and in a few days I will start reading through and posting about Zechariah. Thanks Gavin – I’ve thought for some time that the ringing echo of Rev, when all else has died away, the portents and prophecies and suffering, is the doxologies.